When I was 13 years old, one of my parents’ friends gave them a bottle of homemade coffee liqueur. I remember my dad being particularly pleased with its arrival. His favorite way to eat it was to stream a generous pour over several scoops of vanilla ice cream. Once in a great while, he’d let me have the tiniest taste. I though it was heaven. I’ve always been some of a fiend for sweet, coffee-flavored things. Last year, Molly posted a recipe for Coffee Vanilla Bean Liqueur and I took note. I never got around to making it then (writing a cookbook means that you don’t get to many of the recipes that look appealing) and this year I was committed to mixing up a batch. Yesterday, I bought a bottle of inexpensive vodka and today, I spent ten minutes putting my batch of coffee liqueur (also known in some circles as Kahlua) together. 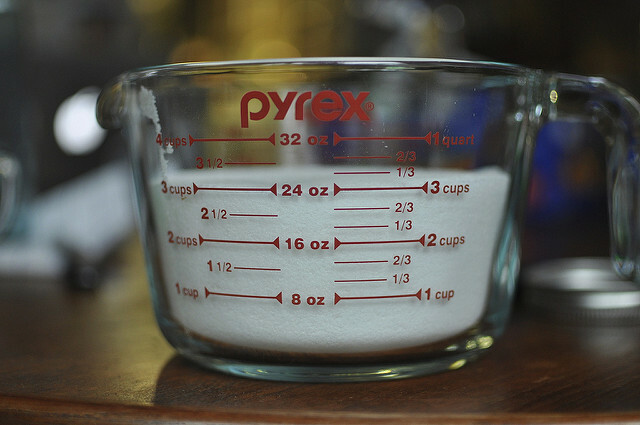 I combined 3 cups granulated white sugar with 2 cups water and heated until the sugar was dissolved. Next I added 3/4 cup instant espresso (this is actually an ingredient I try to keep on hand, as it is an easy way to add high quality coffee flavor to a variety of baked goods) and whisked vigorously until it was fully dissolved. Once all the little grains of coffee are gone, remove the pot from the heat. I split and scraped 3 vanilla beans (Molly’s original recipe only calls for two, but three fell out of the bag, so I took it as an omen) and stirred the seeds into the sweetened coffee slurry. Finally, I added 3 cups vodka and whisked to combine. I funneled the nascent coffee liqueur into a 1/2 gallon jar, dropped in the vanilla bean pods and capped it. I hear it needs to sit for at least three weeks, though four to six is even better. I’ll be away for Christmas, but hope to crack the jar for a few friends on New Year’s Eve, which means I’ve just squeaked under the wire as far as starting the batch goes. If you’re feeling like it’s too late to make something like this for holiday giving, I firmly believe that there’s nothing wrong with giving someone a jar of homemade liqueur that has a note, instructing them not to open it until the first or second week of January. Think of it as a holiday season extension. Who wouldn’t like that? I’m making something like this right now with some REALLY cheap vodka. I just placed two packs of hot chocolate mix, a tablespoon of spearmint black tea, and 3-4 tablespoons of coffee into half a bottle. I’m going to filter it and see how well it comes out after I get another bottle of vodka to play with. I made kahlua for the first time this year. However, I ended up with a foam on the top of mine. I don’t think it will affect the taste but it looks not very appetizing. Any thoughts from your experience what I can do to not have that happen when I make the next batch? If you’re having a problem with foam, just skim it off or strain the liqueur through a couple layers of cheesecloth. After you make a batch, does it have to sit undisturbed for the duration? Or can it be moved/shipped/sloshed around? I live across the world from my family, but I know this is something my father would enjoy since I remember him making it when I was a child. It doesn’t need to sit undisturbed. You can move it, ship it and slosh it. oh, I love this! I just came into a few vanilla beans and I know my sister would love something like this! Hi, how long will this stay good? It should keep indefinitely if you keep in well sealed in a cool, dark place. I made some several years ago and I have it stored in a clear Patron tequila bottle and its still good or better than ever. what are your thoughts on using real coffee for this purpose? i love instant espresso in baked goods, but the idea of drinking it sort of grosses me out. Nora, I haven’t tried it, so I’m not sure what the proportions would be. I can tell you that it’s pretty darn fabulous, even in its first moments, with the instant espresso. thanks so much! right now i have cranberry orange liqueur and blackberry brandy in the works. gonna be a festive new year!!! @wendy – come to hoboken! the liquor is ready! i must admit i got a little bit wasted testing the various liquors the other night. quality control, you know! OMG!!! What a fabulous idea! I am so glad I stumbled upon your site a couple years ago! AWESOME! Gonna start this ASAP! mmm. I’m going to try wassail as gift… Love your ideas BTW! Marisa, I love that half gallon ball jar. Where did you get that? It’s an old blue glass one. I got it at a thrift store some years back. They’re fairly easy to find in antique stores and on eBay. I’ve been considering making some liqueurs like this for Christmas, including a Limoncello. Several recipes recommend refrigerating. I assumed it was because of the sugar content, but I also thought the high percentage of alcohol should enable the finished product to be shelf-stable. Do you happen to know anything about how safe this type of gift will be un-refrigerated? Refrigeration is unnecessary for this liqueur. 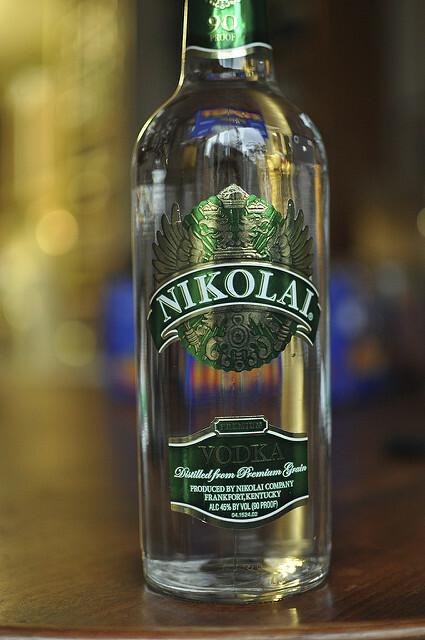 Both vodka and sugar are powerful preservatives. I’ve got to try this (and find room next to the aging bourbon bounce), but I’m not to the point of gifting booze yet, because I’ve yet to make one I like! Strawberry vodka was hideous. It sat in the fridge for a few years and then I started putting it in smoothies in small amounts so I couldn’t taste it. Then peach schnapps which was better, but not great. I’m hoping your bourbon recipe sets me on a new path when I finally open it this month! 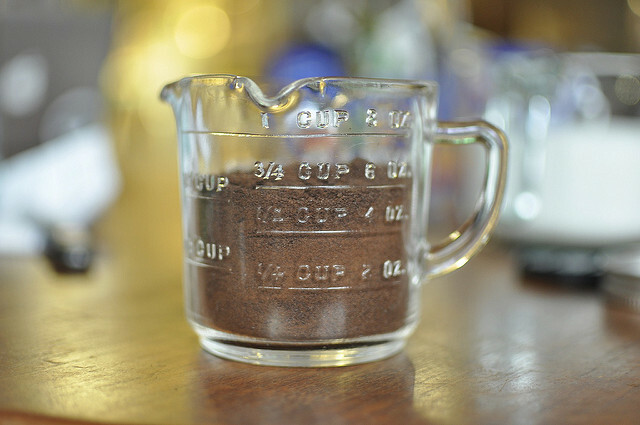 I’ve made this using espresso; recipes using grounds require that you mix them in with the sugar water combination and when the mixture is completed resting, you strain the resulting liqueur using either cheesecloth or coffee filters. I also add a small amount of chocolate liqueur to mine too…just cause. I’m a pretty big coffee drinker myself, so when I made coffee liqueur I just put about a half cup of lightly crushed coffee beans in the bottom of 500 mL of vodka. I added a cup of strong simple syrup after a year (ahem, kinda forgot about it for a while), and it was delicious. I tried this with some vanilla beans and it wasn’t so successful though… it really became more of a vanilla essence though, so I just use it in my baked goods now. Hey Marissa, I’m sure you’ve posted this before, but I can’t find it…where to you like to get vanilla beans from? And is there a particular type of bean you prefer? I’ve seen a couple different types around the internet. Ooo great idea! I can never find instant espresso. 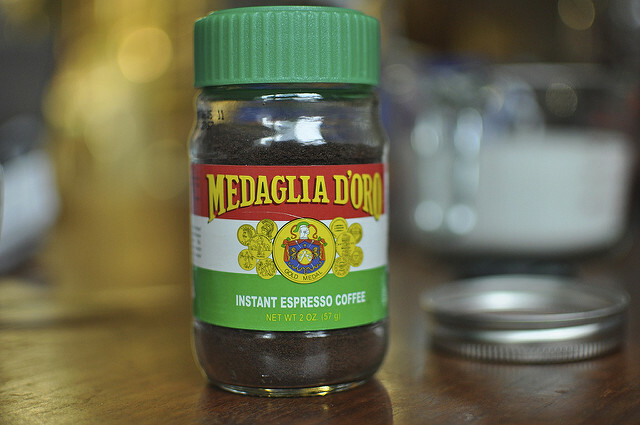 What do you think about using instant coffee instead? Also, where do you get your instant espresso? I wouldn’t use instant coffee, it doesn’t have the same true coffee flavor quality. I made bitters for everyone this year. Now I’m wishing I had made this instead!!! This looks so so simple and I have no doubt it’s magically delicious! 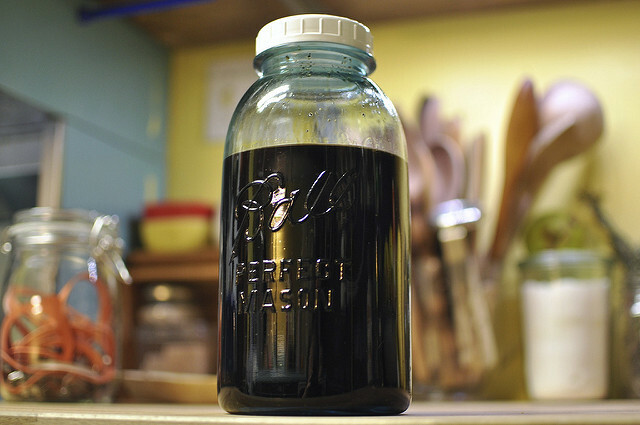 I have made this coffee liqueur for years. Started with a recipe that came with the instant espresso; after many taste tests I have settled on a a basic recipe that uses freshly brewed strong coffee made with a drip filter system or a french press and the cheapest vodka I can find since there is little variation in vodka quality (except for the price!) and fresh vanilla beans. I make gallons each year for gifts; friends bring back their bottles for refills! I use glass gallon jars for the ‘resting’ time, giving the jars a good shake when I think about it and ‘package’ the liqueur in the empty vodka bottles. Store in a cool, dark place (I use a closet). I don’t filter my final product since I like the vanilla seeds to keep flavoring the liqueur. Friends have used rum or brandy as a base, added chocolate syrup and other variations–it’s all drinkable. Enjoy! I’m inspired!!! This is a recipe i will most definitely attempt. This is amazing! Just what I need for my tiramisu. Thanks for the recipe! After brewing the coffee add it to a pot and bring to a boil, slowly add the brown sugar maintaining the boil until it is all in. Then cool the mixture down to room temp (I usually ice bath it to cool quicker) and add the vanilla and alcohol. Technically at this point it is ready to drink but it is best to let it sit two weeks or so. This recipe yields ~96fl oz of Kahlua. What are your thoughts of using decaffeinated instant coffee? I don’t think it will be quite as strong, but if you need to skip the caffeine, it’s a doable substitution. I, also, have been making Kahlua for years to give as gifts. I use Everclear or Clearsprings (190 proof) & instant coffee (regular & decaf). I will have to try the instant espresso. It might just kick it up a notch. Everybody raves about my Kahlua now. Just imagine what they will say when I use espresso??? Hi Marisa! I love this idea! I thought about making homemade vanilla extract this year for Christmas gifts, but every recipe I found says it needs to sit for at least 6 weeks! So that is not going to work for me since it is already November and I need to get the supplies. This recipe sounds fast and it only has to cure for a month! Perfect! I was just wondering how much this yields? I want to put it in individual decorative bottles but I have a lot of people to give it to. Thanks for all the wonderful ideas! Brianna, the recipe makes approximately 5 1/2 to 6 cups. Marisa, this looks amazing! I am always on the hunt for “unique” canning/storage containers for items. Where did you find the fantastic Mason jar you used to store this liquor? I’m looking for some traditionally unique vessels to hold an array of homemade liquors. Thanks! I made this last year and gave little bottles to a couple friends – of course some have already requested refills this year! Luckily I made another batch a few months ago! SO GOOD! I LOVE it on ice cream and in the weekend coffee! Groan! 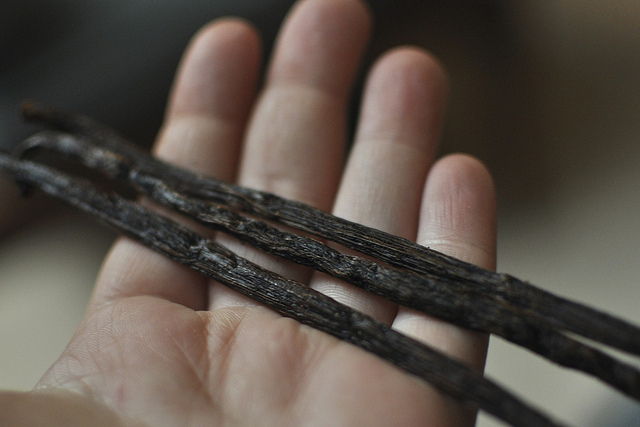 The current price of vanilla beans is two beans for $14.95! Sigh. Sniff. Have you tried buying them online in bulk? Much cheaper that way! We just bought a pound of beans that said it was 80-100 beans. It was actually 110!! At 5 beans for every 8 oz, that should make 22 8 oz bottles of vanilla We ordered the beans online and there was a sale going on as well as free shipping…total cost for the beans was just under $39. They were very aromatic, supple and looked great. So far, so good! I added the zest of 3 naval oranges to mine, 2 cups vodka, and 1 cup black strap rum. It’s awesome now, but need to wait another 4 weeks, 8 weeks total. I do not have the 1/2 gallon jar. Would it be okay for me to use multiple jars to age? How much would you say this makes? The half gallon jar at the end of the post is about 3/4 full, so I’d say it makes 6 cups (there are 8 cups in a half gallon).